I did a slow burn for a couple of days over that one, dreaming up hotheaded, sarcastic replies. Then I decided to answer the question. What would be the discussion? Using data from government, industry and academic surveys and other research, the authors – Robin H. Pugh Yi, Ph.D., and Craig T. Dearfield, M.A. – found that women employed in newspaper newsrooms hovered at around 37 percent from 1999 through 2010, rising to 40.5 percent in 2011. A separate study by the American Society of Newspaper Editors found that women hold just over a third, 34.6 percent, of supervisory positions in newspaper newsrooms, a proportion fairly consistent over the past 12 years. Citing research by the Radio Television Digital News Association, the study found that television has had a far better employment record, with women holding more than half the executive producer, news anchor, news reporter, news producer and news writer positions in 2008. Radio has had a far worse record: Women made up 22 percent of the total radio news force and just 10.7 percent of radio news directors in 2011. Two examples from last week’s news drive home these points. The issue of insurance coverage for birth control vis-à-vis “religious freedom” has been hot news. On Feb. 16, the House Committee on Oversight and Government Reform held a hearing on the topic. 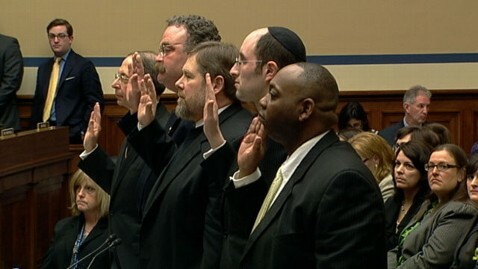 The photo below, from an ABC News blog, shows the first set of witnesses being sworn in. Women on the committee and off it were outraged. Another story that keeps raising questions about gender and news coverage is the year-old story of uprisings in the Arab world. Like many a small-d democrat, I’ve been heartened by the overthrow of tyrants and dictators. But when photos and video of demonstrations in these countries portray a sea of men’s faces, my heart sinks. Who is telling the women’s stories? Maybe their cultures keep Arab women out of the demonstrations, but that doesn’t mean their stories don’t count or that Western reporters shouldn’t be finding a way to tell them. And so, back to my colleague’s question. How do we journalism professors discuss with our students the gender disparities within news organizations and among newsmakers? We prepare for these discussions by staying abreast of the research into issues of diversity, not only of gender but also of race, ethnicity, physical challenges, age and other demographic dividing lines. We monitor the news we read, hear and watch for examples of the stories not told, the stories left out, the relevant perspectives unexplored. During class discussions of current events, we take a step back from the facts and ask students to think about those untold stories and unexamined viewpoints. When we work with students as reporters, we make sure they are going beyond the comfort of sameness to seek comments from others with a stake in the situation. We notice and applaud when their stories include legitimate experts beyond white men, not because white men’s views don’t matter but because others may see things differently, may place emphasis on different aspects of a situation, may give both reporters and readers a deeper understanding because of those different views and emphases. And how do we advise our students regarding the progress of their careers? We make sure we give the same attention and support to students who don’t resemble us as we do to those who remind us of ourselves in our salad days. We talk to all our students about our experiences and observations during our own efforts to advance in the newsroom, whether those efforts took the form of getting the assignments we wanted or of moving up in the newsroom hierarchy. We connect our students with mentors and urge them to join journalism associations where they can find mentors on their own. When we invite guest speakers, we include journalists and newsmakers from diverse backgrounds, not just our friends. We model the behavior we want our students to emulate. We gird them to fight the battles our generation has left unfinished. Glad you posted this issue. I chuckled at your colleague’s question and your initial reaction. Then, I remembered how real and sincere those type of questions are and where they come from. They come from the same space in which people scratch their heads about how to change it. Frankly, I think the study and headline are a bit misleading, especially considering several fields are measured and combined.What’s the baseline for being not in crisis? But I digress. I think the issue easily can get lost or shelved because it’s chock full of related yet sufficiently independent and pressing issues such as how stories are told and why women hold so few positions of power. I think discussion of this topic should be tackled in a number of ways to benefit students. It should be discussed in class among men and women but separated into topics to allow for real discussion and solution-driven answers. It should be discussed among women in groups that advance our issues. Hiring issues should be discussed separate from news coverage and career advancement. They’re “linked” but are issues that are valid enough to stand alone. But really important to me is the practical implications of the findings: So what does all this really mean and how can I take this information to build a stronger career and gain more opportunities? That is what I would want my students to learn from the study and discussions so this study brings real value to future journalists. I think what’s missing, too often, are real discussions, guides or studies that reveal the how-to or how-do-I get there or gain greater career opportunities to people trying to break through the proverbial glass ceiling and stay there.